Aircraft Insurance – Call that Middleman! The Avemco Insurance Company has released a new advertisement in AOPA Pilot depicting a man in a suit falling out of the sky. 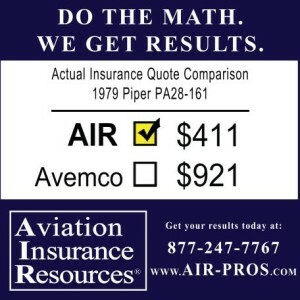 The text reads “We got rid of the middleman” and correctly states that Avemco is the only direct aircraft insurer. This silly ad creates quite the visual, however, there are several reasons why it’s important to have that insurance middleman in your life! Why contact a direct insurance underwriter when you can have over 18 carriers competing for your business-all with one call? The ultimate benefit of this competition is the price. You are more likely to obtain a lower premium when requesting quotations from 18 companies versus just one. Avemco sets their own rates. While the employee you speak to has the simple authority to provide a quotation, they can only supply one quote. 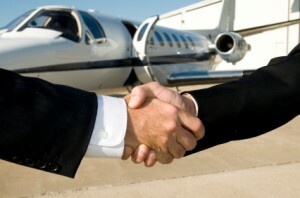 An aviation insurance broker does the work for you-obtaining competitive rates from multiple insurance carriers. More options equal more savings! As stated above, Avemco can supply only one quote and therefore one set of policy terms. Access to multiple carriers creates more flexibility in policy conditions. For example, most pilots transitioning into new aircraft are required to complete some dual instruction or formal manufacturer training which can be costly. Training requirements vary by underwriter and the pilot can pick the policy that has the training requirements that best fits his or her needs. Other options that vary from carrier to carrier would be available liability limits or the open pilot warranty. The aviation industry is ever-changing and it is important to have an insurance policy that changes with it. Most insurance carriers have adapted a “per passenger” policy form. Meaning the sub-limits on the liability portion of your policy are limited to passengers only. Avemco still uses a below standard policy form, their sub-limits are written on a “per person” basis. Therefore, anyone injured inside or outside of the aircraft are limited to only $100,000! In addition, thanks to the many aviation insurance carriers in the market, it is possible to obtain a policy without a sub-limit, also known as “smooth limits”. We challenge you to see the results a middleman can provide! At Aviation Insurance Resources (AIR) all our agents are pilots so we understand your needs as a pilot and aircraft owner. The graphics below say it all-our efforts will save you both time and money. Call our agent and pilots at 877-247-7767 or click here to request a quote online to start saving today! Posted in AIR-Pros News, Aviation Insurance | Comments Off on Aircraft Insurance – Call that Middleman! Summer may be over, but the best flying weather is still to come. For those looking to escape the chilly weather and spend time with aviation enthusiasts, the Deland Sport Aviation Showcase in DeLand, FL is THE place to be this November! The inaugural event aims to showcase all aspects of light sport aviation through DeLand’s “Sport Aviation Village” featuring a plethora of forums and exhibitors. Booth #308 in the showcase will have some familiar faces! Those of Chris Wolbert, Gregg Ellsworth, Joe Ruck, Joe Cacho and Jon Harden, aviation insurance specialists at Aviation Insurance Resources (AIR). As pilots themselves, the agents of AIR love to get into the heart of the industry and meet personally with the pilots and business owners they serve. 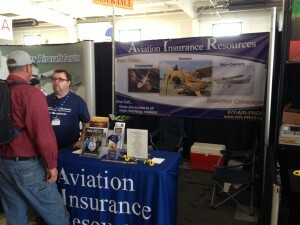 Stop by the AIR booth to discuss your aircraft insurance or just “hangar fly”. Chris Wolbert and Gregg Ellsworth will be sharing their expertise Friday the 4th with their presentation “The Aviation Insurance Market Place Today: Always Changing”. Guests are encouraged to stop by Forum 2 at 3:30pm to learn the basics of aviation insurance and how industry changes are affecting you. Just 40 miles north of Orlando, the DeLand Sport Aviation Village and Showcase runs November 3rd through 5th following the NBAA convention. Camping is available on the airport and shuttles are available to nearby hotels. To learn more about this great event visit: sportaviationvillage.com. In June of 2013, we published one of our most popular blogs on Mooney Aircraft insurance. Since the original posting, Aviation Insurance Resources (AIR) has continued to provide prospective and current Mooney owners with superior customer service while obtaining the best insurance rates and the broadest coverage available. Read on to find out why Mooney Aircraft has become a quick pilot favorite over the years. June 24, 2013 – Christopher Wolbert, Regional Vice President of AIR completed his instrument rating in a Mooney twenty years ago. Despite the time that has passed, Mooney aircraft remain one of his favorite aircraft manufacturers. 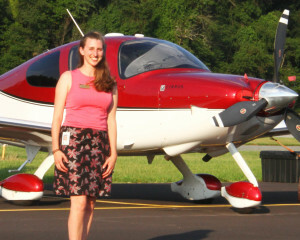 “Until that point, I had completed most of my pilot training in Cessna Aircraft. The Mooney was a new and exciting experience. The aircraft’s additional speed combined with instrument training made my training challenging, but rewarding.” Chris remembers. First pressurized single-engine, piston-powered aircraft (M22 Mustang). Fastest transcontinental flight in a single-engine, piston-powered production aircraft (M20K 231). First production aircraft to achieve 200 mph on 200HP (M20J 201). Several altitude records (M20K 231). First single-engine, power-control certified (FADEC) in the U.S. (M20L Porsche). Fastest piston-powered aircraft currently in production (M20M DX single). First single-engine aircraft certified for flight into known icing conditions (M20M DX w/TKS anti-icing system). More than 130 world speed records. First single-engine retractable to achieve 237 KTS (M20). Mooney aircraft combine legendary speed, robust rate-of-climb, rock-solid safety and security, innovative technology, hand-built precision craftsmanship, and unmatched value. 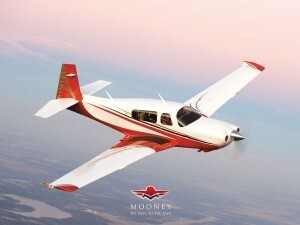 The Mooney Airplane Company – which has delivered more than 11,000 aircraft worldwide, a fleet that has amassed more than 40 million hours of flight – currently sells three models of the M20: Ovation2 GX, Ovation3 and Acclaim. Aviation Insurance Resources, also known by the acronym AIR, represents all of the major aviation insurance markets, which allows us to offer the broadest package of protection at the best available rates. AIR provides a wide range of aircraft insurance options for aircraft of all makes and models, from Cessna Aircraft to Robinson Helicopters to Piper Cubs to, of course, Mooney aircraft, like the Ovation2 GX, Ovation3 and Acclaim. AIR is licensed in all 50 states. Click Here for a FREE Aircraft Insurance Quote! To find out more about Mooney Aircraft Insurance, please contact Aviation Insurance Resources by calling 877-247-7767 or visit AIR-PROS.com today to receive your free Aircraft insurance quote! You can also follow us on Facebook, Twitter, LinkedIn, Pinterest, and Google+. How to get the best rate on your aircraft insurance in one easy step! Before purchasing an aircraft, most pilots complete a cost analysis to determine the annual expenses and sustainability of aircraft ownership. Lower aircraft expenses generally mean more time in the air for the pilot and ways to safely cut these costs are often pursued. While aircraft insurance is a smaller percentage of annual aircraft expenses, it is an area that is worth the extra research to reduce rates. One company takes the challenge out of finding the lowest rate for your aircraft insurance while maintaining the broadest package of protection. Founded by two pilots in 1999, Aviation Insurance Resources (AIR) solicits quotations from the major underwriters that would be the most competitive for the type of flying you do and the coverages you require. AIR has since continued to grow and prides itself in the tagline “Pilots Protecting Pilots” as all our agents are also pilots and share a great passion for the aviation industry. AIR also has four locations across the United States to better serve you! Serving our fellow pilots for over 17 years, AIR understands the budgeting needs of aircraft owners and aviation business operators. Call Aviation Insurance Resources (AIR) at 301-682-6200 or complete an online request to start saving today! You can also follow us on Facebook, Twitter, LinkedIn, and Google+. 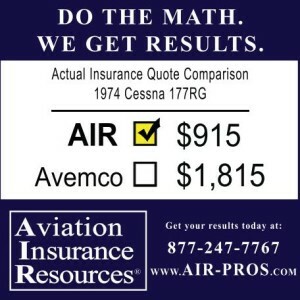 Posted in AIR-Pros News, Aviation Insurance | Comments Off on How to get the best rate on your aircraft insurance in one easy step! New for this year, the Aircraft Owners and Pilot Association (AOPA) is hosting aviation fly-ins around the country to meet its members and to join pilots and aviation enthusiasts together. On Saturday, October 4th AOPA will have a homecoming celebration, bringing the fly-in back to Frederick Municipal Airport (KFDK) for the first time in five years. The event takes off at 8:30am with a pancake breakfast (register here) and continues with a day of aircraft exhibits and free seminars. At 2:30pm AOPA president, Mark Baker, will conduct a Pilot Town Hall meeting. 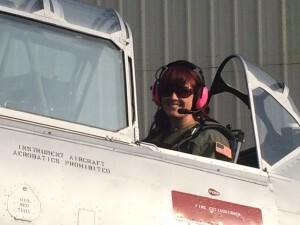 Other activities include flights in the EAA’s B-17 Flying Fortress (sign up here) and an aerobatic performance by Red Bull Air Race Champion pilot Michael Goulian. The event closes at 4pm. The aircraft insurance specialists at Aviation Insurance Resources (AIR) will have a booth and a cookout at the AOPA homecoming. Aviation plays an important role in the lives of the agents and pilots at AIR and those in the Frederick Home Office spend many a day flying (and hangar flying) out at KFDK. All agents from the Frederick Home Office will be in attendance as well as Melissa McKinley, who manages the Bradford, Pennsylvania location. You can greet the agents at Booth #21 in the exhibitor tent next to AOPA headquarters from 9am to 4pm. AIR is also hosting a free cookout for new and prospective clients and friends at Hangar E7 from 11am to 2:30pm! AIR and AOPA are based in the beautiful city of Frederick, MD. Historic downtown Frederick offers fantastic shopping, restaurants offering various culinary experiences and a strolls along a scenic creek and park. Frederick is also just under a 50 mile drive from Baltimore and Washington D.C. as well as only 20 miles from Harpers Ferry National Historical Park. Among the clouds there are many invisible boundaries that pilots must adhere to. Established for security concerns, special events, or even defining the rules of flight for airspace surrounding an airport, these boundaries are important to know about before each flight. One of the most widely known types of airspace is the Special Flight Rules Area, or SFRA, around the nation’s capital of Washington D.C. which plays a role when flying in the vicinity of FDK. You can learn more about the Washington D.C. SFRA here. AOPA is the largest general aviation association in the world dedicated to protecting its members’ freedom to fly. AOPA member services include legal services, advice, educational events and advocacy work with the U.S. government. You may learn more about AOPA at www.AOPA.org. Aviation Insurance Resources provides a full range of aircraft insurance and aviation insurance products to clients of all sizes. AIR represents all of the major insurance markets and offers the broadest package of protection and the best available rates. To learn more about the Aviation Insurance Resources, please call 877-247-7767 or visit AIR-PROS.com today and receive an Aircraft insurance quote! You can also follow AIR on Facebook, Twitter, LinkedIn, and Google+. For three days each year, Mt. Vernon Outland Airport (MVN) in Mt. Vernon, IL becomes the mecca for light sport aircraft (LSA). September 4th through 6th marks the dates for the 6th annual Plane & Pilot Midwest LSA Expo inviting sport pilots, LSA manufacturers and aviation enthusiasts alike to enjoy informative workshops, light sport related exhibitors and enjoyable airport nightlife! Most of all, the entire event is FREE to attend and parking for cars and aircraft are free as well! Aviation Insurance Resources (AIR) is delighted to attend this small but mighty expo again. You can meet AIR agent and pilot Gregg Ellsworth inside the expo exhibitor area. 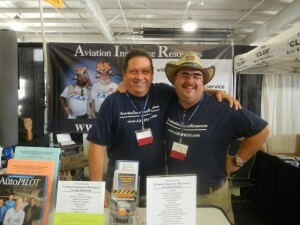 For more information on attending the Plane & Pilot Midwest LSA Expo, please visit their website at: MidwestLSAShow.com. From the inception of light sport certification, AIR has been providing sport and more advanced rated pilots with light sport aircraft insurance policies with broad terms and at competitive premiums. AIR covers the insured every step of the way, offering builders risk policies during the constructions process regardless of pilot experience. To see how AIR can help you with your LSA insurance needs, please call 877-247-7767 or visit AIR-PROS.com today and receive your aircraft insurance quote! You can also follow us on Facebook, Twitter, LinkedIn, and Google+. For 51 weeks a year, EAA is an international community of more than 160,000 aviation enthusiasts that share their passions for flying, building, and restoring of recreational aircraft. But for one week each summer, EAA members and aviation enthusiasts totaling more than 500,000 from more than 60 countries attend EAA AirVenture at Wittman Regional Airport in Oshkosh, Wisconsin. It’s that time of year again! EAA AirVenture 2014 – The World’s Greatest Aviation Celebration – features more than 10,000 aircraft; daily air shows; nightly entertainers,; forums and hands-on workshops, and so much more. As usual, Aviation Insurance Resources (AIR) is attending all week at booth #1141 in Building A. AIR offers a wide range of aircraft insurance options for aircraft of all makes and models, from experimental aircraft to standard aircraft such as Cessna Aircraft, Beechcraft, and Cirrus Aircraft to Robinson Helicopters, Piper Cubs, and Corporate Aircraft. We are always happy to meet our customers and pilot friends. Stop by for a quote; get answers to your insurance questions or just to tell us your favorite flying stories! We are excited to meet you. Safe flying! To find out more about EAA AirVenture 2014 in Oshkosh or Aircraft Insurance, please contact Aviation Insurance Resources by calling 877-247-7767 or visit AIR-PROS.com today to receive your free Aircraft insurance quote! You can also follow us on Facebook, Twitter, LinkedIn, and Google+. EAA AirVenture is almost here! Are you ready? Soon, thousands of pilots and aviation enthusiasts will gather on the grounds of Wittman Regional Airport in Oshkosh, WI for the 2014 EAA AirVenture. Featuring over 10,000 aircraft and a daily airshow, Oshkosh is the place to be in July! Are you ready? With an event spanning an entire week, weather and plans can be quick to change! Whether staying for one day or the entire week, it’s best to be prepared. Are you ready? Looking to purchase an aircraft? Oshkosh is the perfect venue to scope out a new pair of wings. To compile a proper estimate of flight costs, you’ll need an insurance quote. Are you ready? The agents at AIR are pilots and aviation enthusiasts who look forward to attending AirVenture each and every year. We hope that with proper preparation, you enjoy it as much as we do! Who knows, maybe you’ll be arriving in 2015 with your new pair of wings! Are you ready? We are! To get ready ahead of time for an aircraft insurance quote, please contact Aviation Insurance Resources by calling 877-247-7767 or visit AIR-PROS.com today to fill out an online application. You can also follow us on Facebook, Twitter, LinkedIn, and Google+. Posted in AIR-Pros News, Airshows, Aviation Insurance, EAA AirVenture | Comments Off on EAA AirVenture is almost here! Are you ready? NBAA 2013, the sixth largest tradeshow in the United States, is touted as the can’t-miss business aviation event of the year. With an expected 25,000+ attendees, including key operators and industry leaders, NBAA 2013 will showcase the world’s finest business aircraft, services and products. You know that AIR offers a wide range of aircraft insurance options for aircraft of all makes and models, from Cessna Aircraft, Beechcraft, and Cirrus Aircraft to Robinson Helicopters, and Piper Cubs, but did you know that we also offer Business Aircraft Insurance? As a member of NBAA, AIR can guide you through the details of insuring a business aircraft. AIR boasts the broadest package of protection at the best available rates. All of the insurance companies we represent are A.M. Best rated “A” or better. Best of all, AIR is licensed in all 50 states. To find out more about the NBAA 2013 or Aviation Insurance, please contact Aviation Insurance Resources by calling 877-247-7767 or visit AIR-PROS.com today to receive your free Aircraft insurance quote!